Hello! Milena here. I have been collecting dolls since 2008. I make roomboxes, furniture and accessories for them. 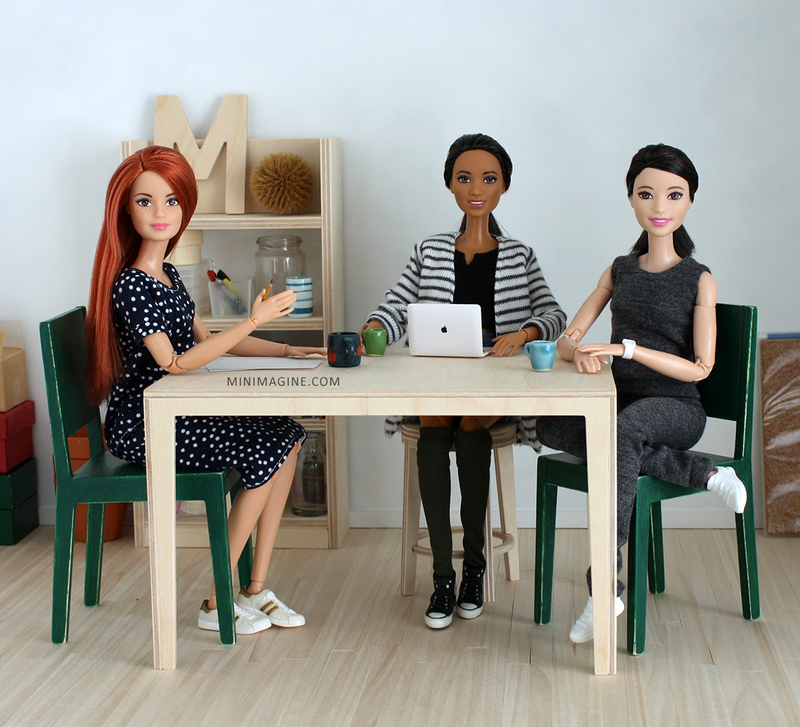 I created Minimagine to help adult collectors build awesome dioramas for fashion dolls. Items by Minimagine are high quality: sturdy, carefully finished (hand polished with sand paper) and made of plywood and pinewood (not of soft balsa wood). They are designed by doll collector for adult recipients. My roomboxes and furniture look realistic because they fit the doll scale and are made of real materials (wooden floor, glass window panes). That's all that you need to set a great diorama and take nice photos. 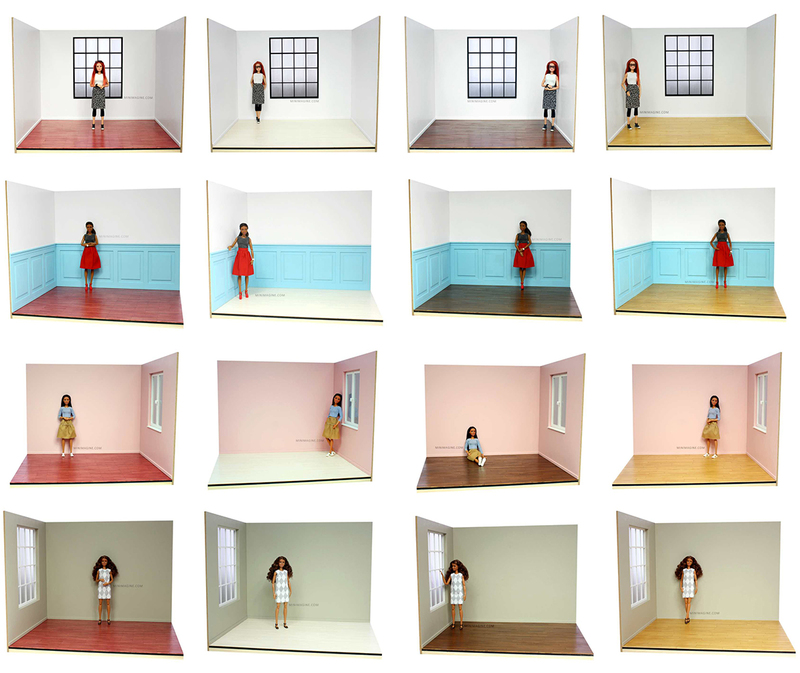 ROOMBOXES are perfect backgrounds for many doll scenes - both for static dioramas and doll stories. Modular system of roomboxes allows to build two or three-walls rooms and to join them with another. You can change floors and walls between each other. These roomboxes are also easy to assemble and storage. Would you like some examples? Look it up here. FURNITURE made by me are intended for 10-12,5" dolls like Barbie, Momoko, Fashion Royalty, Poppy Parker, etc. I sometimes offer furniture for 16" dolls. I am going to create many new furniture pieces for dolls in 1:6 scale soon. Items created by me until now are presented here. WHAT DO HUNDREDS OF SATISFIED CUSTOMERS THINK ABOUT ITEMS BY MINIMAGINE? "Beautiful and very well made doll furniture. Great attention to detail and packaged with care. I highly recommend this very professional miniature artisan." "I'm thrilled to bits! Wonderful roombox, fabulous workmanship and very smart construction. It's so much fun to play with. Many many thanks, Milena!!!" "Very well crafted. It fits my dolls so well." "This is the most exquisitely crafted miniature desk I've ever seen! Incredible attention to detail." "Beautiful roombox! Made with care and precision. Well protected for shipping." "Thank you so much for this perfect little stool! Your skills are amazing, it's exactly what I was looking for and thank you as well for the lovely communication! Highly recommended!" "Wonderful doll furnishings. I love Milena's work." "Amazing little, sturdy and perfect chair! The blue-gray color turned out much more beautiful than I expected; and like the table, this is so well made, too. Very well packaged for a long overseas journey, too. Arrived in perfect condition. I wish I could decorate my home with Minimagine's furniture. I'm so jealous of 1/6 scale life now! "Beautiful chair - very well made and excellent service." "Extremely well made with perfect attention to detail. My barbies love it! Absolutely perfect. Fabulous seller with great communication." "I just love this furniture. Great quality and it looks amazing!" "Beautiful, well-designed and -crafted outfit, superb service. Highly recommendable." "I am so happy with the quality of these chairs! 100% PERFECT!" "Excellent in every way!! Absolutely perfect…I Love! Thank you." "I love it very much. Everything is as what I wanted. Definitely will buy more." "Perfect again! A pleasure to deal with." "Beautiful work as usual, a great addition to my mini furniture collection. I love it!" Check over 300 reviews from my satisfied customers. Find out how others use my roomboxes and furniture. Roomboxes and furniture by Minimagine are for sale several times a year. Subscribers always know first about shop opening. Custom orders are closed in 2018. Join my mailing list to be informed when and where online my items will be available. How did you find out about Minimagine? INSTAGRAM and FACEBOOK. Follow me if you would like to know what's new with me. Almost every day I post pictures of dolls, furniture and dioramas. I also show customers' photos of my items. BLOG. What will you find there? Over 300 entries full of doll photos and inspiration. Furniture, dioramas, clothes and accessories. Guests. My doll collection. Tips. Cats. I suggest you start with these featured posts.